Quite often our clients have a need to manage data but do not have a solution in place to do so. 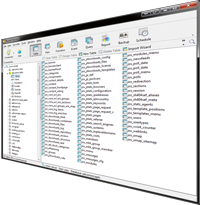 We have successfully developed databases to meet our clients' need to manage data. We integrate the backend programming with custom front-end web design. We offer a full service of bespoke database designs which are specific to the customers needs. We will spend time within your company to learn your processes and design a database that meets your exact needs. The database can be accessed from ANY web-browser within your internal network, and will be accessible from Windows, Linux etc. We can also make your application accessible from your PDA's too.